AlivePromo sees uptick In LED Tile Display Integration. 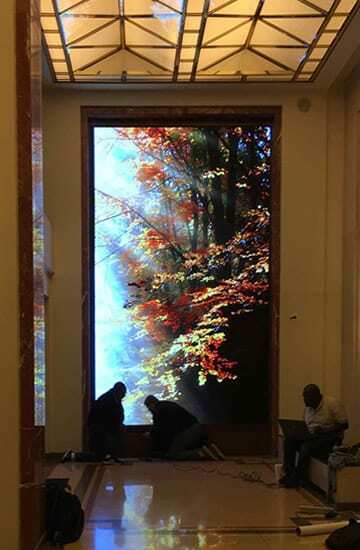 AlivePromo > News > AlivePromo sees uptick In LED Tile Display Integration. January 9, 2017 – AlivePromo sees its LED tile integrations increase as resolution improves. AlivePromo, Inc. in Minneapolis, Minnesota, a long time leading provider of digital display solutions for buildings and properties, began integrating LED tile technology back in 2012. While common outdoors (e.g. Times Square and Las Vegas) and in stadiums, the technology was just getting to a point where it was becoming affordable as an interior choice, as well as an exterior one. The resolution was getting better, but still a bit out of reach for situations where a clean and crisp image was required for close up viewing. Fast forward to 2017 and high resolution LED tile specs of 1.25 to 3.9 mm are becoming more realistic. LED tile has found its place in interior designs. Rogers does say that a UHD 4k or 5K display is still the go-to display for the best resolution for close up viewing of detailed images, but that LED tile is not far behind. “We are involved in some amazing projects currently that could not have been accomplished even a couple years ago”, says Rogers. “LED tile allows for maximum creativity. We can now more than ever assist architects and interior professionals to include LED tile in their designs in the sense that it is a surface treatment like wall systems, paint, glass, etc.,” he adds. AlivePromo is currently working on several LED tile feature walls and integrations around the country and expects to see more of its clients opt for an LED tile based system. AlivePromo integrates directories into Orlando’s tallest office tower.